Happy almost Halloween! I thought the weirdos pictured above would be fitting to post about in honor of the occasion. I don't really know much about them, aside from the fact that there are six different sculpts that came in six different colors. I got my first few in a trade recently, and then my bud Justin/Metalmonkey was kind enough to hook me up with a bunch more (thanks again, Justin!). 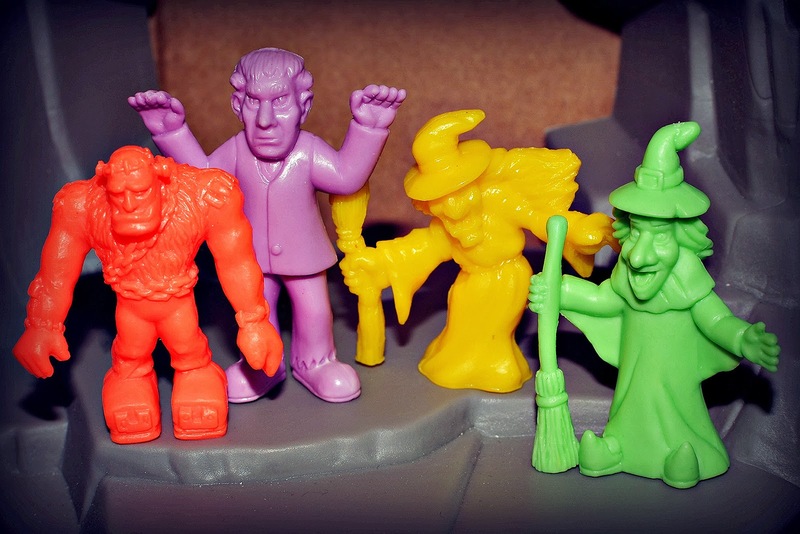 Below is a roundup of the six different monsters included in the set. Each came in red, blue, neon orange, light purple, light green, and neon pink. VAMPIRE/DRACULA: Fairly standard-looking blood-sucker. For some reason he appears to be wearing clown shoes (?). SKELETON: I like that he kind of looks like he's doing a little skeleton dance (especially my blue one, whose right leg is bent a bit upward). 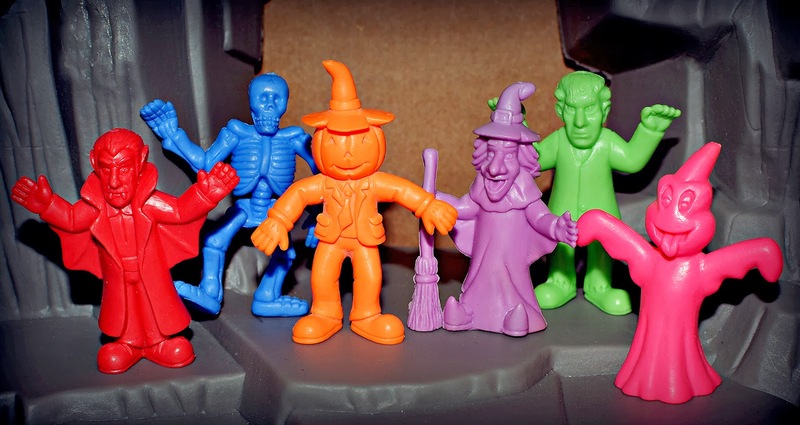 It would be cool to build any army along with the skeleton figures from MIMP, Neclos Fortress, etc. JACK O LANTERN/SCARECROW: The least monstrous figure of the set. WITCH: I think this one's my favorite. I enjoy how gleefully psychotic she looks. Looking at her next to the MIMP witch, I wonder if the MIMP figure was the inspiration here. The facial expression/shape and overall pose are similar. FRANKENSTEIN'S MONSTER: The body is pretty simple, but I like his face. His expression looks appropriately vacant and cranky. GHOST: This is a goofy ghost. I mean, his tongue's sticking out. And he looks a bit high. I dig him. What do you think of these guys? I actually don't know if these were sold under a specific name, or just generically as Halloween toys in dollar stores or something. I'm also not sure when exactly they were available. If anyone has any additional information about these, please let us know! Youre welcome man, glad you like these. :) I think theyre pretty neat also, the colours and the rubber theyre made from are both awesome! 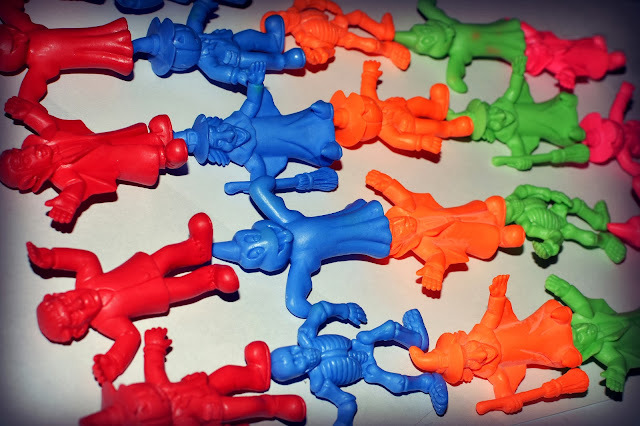 I only know them as 'haloween eraser figures' and that they're from West Virgina. For the price the seller was asking, i think theyre great. :D heres the item # 350248435332 for ebay to see their old listing. Nice! That was a great price. Always great to discover new monster mini figures. Thanks for the heads up! I totally picked up a set. Glad you found it helpful. Where'd you manage to find a set? I found them a dead ebay auction searching and messaged the seller (playful-gifts). I really love generic mono monsters, the translucent creatures you posted are another one of my favorites. Ah, great that they still had some!